Home / Bowling Tips and Techniques / Coaching / Getting Conflicting Advice, and What’s More Important: Technique or Results? Getting Conflicting Advice, and What’s More Important: Technique or Results? Welcome a new contributor to the Round Table, PBA Champion and Silver coach Jeff Carter. He’s one of the successful coaches who will be leading us through a discussion on two interesting questions. Our first topic deals with the best way to handle getting coaching advice from multiple sources. I think the second question is a great one. I’m really interested to see how our experts respond to the question of whether it more important to have good results or good technique. Here’s our panel and what they have to say. Over the years I’ve watched several instructional videos and have worked with several different coaches with mixed results. What is your advice on the best way to handle a situation in which coaches are offering differing advice? How do you know what’s best for your own game? The first thing I would recommend is to pick one coach and stick with that person. Do some research on the coach’s credentials and find somebody you wholeheartedly trust. You need to have total confidence in the person. There really is a ton of information available if you look in the right places. Pick somebody with whom you can mesh and are comfortable with. If your game needs a long term fix, you could be with this coach for a long time. Each coach’s style and methods are different. This doesn’t mean one is right and one is wrong. It just means there are many different ways to teach our sport and opinions may differ. This is why it’s very important to qualify your coach. Ask for references if needed and check with other students they have coached. If you’re in a camp or clinic setting with multiple coaches and different ones than you would normally use, you can pick and choose certain items/methods you can incorporate into your game. Make sure you involve your current coach in these cases, so he can give you input and know what direction you are heading. Keep in mind, though, sometimes you can go into information overload and make things worse instead of better. Best case scenario is always One Coach…One Voice! I admire you for searching out lots of information to contribute to your knowledge base. Now, you’ll just have to be patient enough and skeptical enough to figure out what turns your light on, what you should keep and own, and what you should discard. Discernment is critical in your development as a player. As you wend your way through the learning, don’t be too quick to discount or eliminate something a coach has told you. If one coach tells you to hinge your pushoff and another tells you to elongate it, which one is right? Well, could be both. The only way you’ll know is to experiment with both, albeit one at a time. What does hinging your push do to you or for you? Is there a condition for which that feeling or that motion would be desirable? Whatever that hinged push gets you can become a valuable part of your arsenal. It may not be your most often used technique, but it will come in handy if you’re a tournament player. There is no one way to get this done. That’s why different eyes have different suggestions for you. To discount something a coach said on Monday because of what you saw in an instructional video on Tuesday is a great disservice to you. Give all the ideas a thorough investigation and lengthy trial before you decide something isn’t for you. That way you can be sure the new trick belongs in your every day toolbox, only comes out to play occasionally, or just won’t work for you. I’ve been fortunate to work with some of, if not the, best coaches in the game. The knowledge I have accumulated from Wayne Sanders, my father, Gordon Vadakin, Pat Henry, Fred Borden, Jeri Edwards, Rick Benoit, Mike Jasnau, Mark Baker, and yes – even my wife Lynda – have had a huge impact on my success over the years. That being said, not everything we tried over the years worked for me despite having great results for other players. My advice is to give basically everything a fair chance. I am not a big believer in you have to get worse before you get better. Therefore, I have given many ideas a “fair chance” – meaning 100 shots or so to see if I could start the integration into what I already do. At that point, if it felt pretty comfortable, I would commit to the idea and go forward with adding the piece of advice to my toolbox. Almost every change I have made over the years I looked at as an addition to my game. Therefore, I always had a safe place – a home – to go back to if the additions didn’t work. This has allowed me to receive information from the best minds in the game and apply the ones that worked best without going backward in the process. This is a fantastic question and one that I deal with on a regular basis. I often have differing opinions from other coaches and when that happens I explain why I think my suggestion is best for that particular student, but the proof will always be in the pudding. If my suggestion can’t show improved results pretty quickly, then the bowler will have to decide which way works best for them. Anytime you hear conflicting advice between coaches, make sure you let the one you are currently working with know. That coach should be able to listen to the advice you were given by the other coach and resolve issue. There is nothing I love more than to be challenged by a student or another coach; that’s how we learn. Keep in mind there may not be a right and wrong answer, just a different answer. The great coaches of the world are like sculptors. If you give six great sculptors a big piece of rock and tell them to chisel a horse, you will most likely end up with six beautiful horses and none of them will look alike. If you take lessons from six great coaches, I can guarantee you that they will all tell you something different and they will all make you a better bowler. Conflicting instructions don’t even have to come from two different coaches; they can come from the same coach. It’s not unusual for one of my long time students to tell me I am telling them to do something completely opposite of what I told them to do a year ago. That happens because the student is a totally different bowler than they were a year ago. Different skill levels often get different advice. You also have to consider the reputation of the coaches involved if you are getting conflicting information. 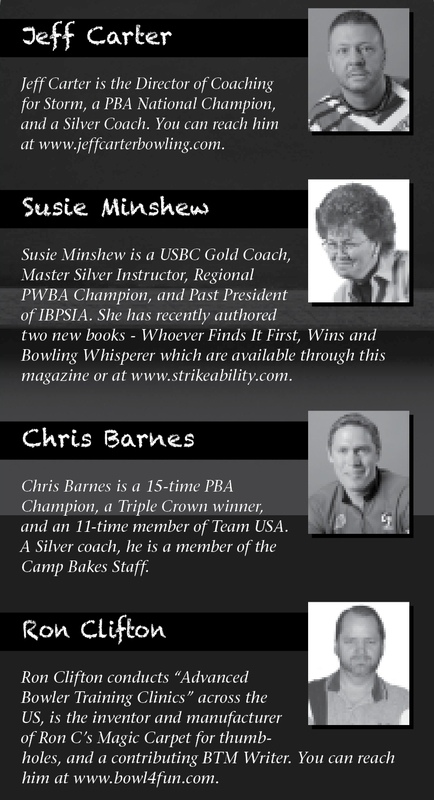 There are as many different levels of bowling coaches as there are bowlers. I am not referring to the Bronze, Silver, and Gold certifications of USBC, but rather the reputations and accomplishments of individual coaches. There are several nationally known coaches like myself who have never been certified by any organization, yet we are sought by some of the best bowlers in the world when they need help. I know my timing is off, I tend to muscle my swing and fall out of too many shots so I look like a bad bowler but my results tend to be okay most of the time. When I try to change my approach to look better, it seems to throw me off and my results are worse. In your opinion what’s more important, technique or results, and why? In my opinion technique is ALWAYS the most important factor. One of the main reasons you may be getting good results with improper balance and a muscled swing is quite simply “lane help.” The lane conditions probably allow you to get away with numerous bad shots and, unless you recognize those bad shots, you will stunt your bowling growth. I feel the two most important parts of a bowler’s physical game are balance/foul line position and free armswing. You mentioned both in your question, so that would tell me we need to fix both simultaneously. Make sure the swing is free from muscle, especially from the top of the swing down. Let gravity do its job and simply allow the ball to drop into the downswing. At that point, balance and leverage become the key. Once you get your balance under control, you will notice that your shotmaking ability and consistency will skyrocket. This in turn will help in scoring and not just on house patterns. You will become more competitive in a tougher scoring environment as well. The greatest bowlers in the world have one thing in common and that’s great balance at the foul line. There aren’t any style points! You can look up and down the lanes in your league and see there all kinds of ways to get the job done. In fact, you can do that anytime bowling is on television. It is certainly easy to enjoy watching aesthetically pleasing bowlers like Pete or Parker. But sometimes their results aren’t any better than a stumbling, falling off player. Over the long haul, however, that bumbling dude can’t stay with players who don’t have all that extra motion in their game. So, although there may not be any style points, there are style advantages. If you fall off the same amount, in the same direction, at exactly the same moment in your approach, and land in the same spot every time, and these contortions are what the lane requires, you’ll be fine. If, occasionally, you don’t fall off or fall off later or less than “normal,” those differences will manifest in score. You attribute it to the left lane not carrying or a hang spot down lane when the truth is you missed it at the bottom as you were hopping around. Pete and Parker have simple games – not a lot of extraneous movement and not a lot of places to look if something goes awry. Their “looking better” is actually a smooth and flowing movement to the line, almost graceful. Their bank accounts and trophy cases, not to mention their longevity, are results of being “pretty,” since that pretty translates to a simple, elegant, and most importantly, easy-to-repeat, game. Their read is always right on. They don’t wonder if it was them or the lane. They didn’t get this smooth overnight. They honed their skills, removing complicating factors from their game, and keeping the things that allowed them to flow. If it didn’t work the first few times, they kept after it. Since there aren’t any truly successful hopping players, you might consider working longer on your technique to see if your results over the long term improve, (which they will). Repeatable technique equals great results. Besides, why would you settle for your results being just “okay”? Why not go for spectacular? This is a very interesting and great question. When it comes to the simplest form of the question, I tend to fall back on an analogy from one of my best friends (and my coach Mark Baker) regarding the Hall of Fame. There are many technically sound or “pretty bowlers” in the Hall of Fame – but EVERYONE in the Hall of Fame had great results. Therefore results are more important – but with a caveat. The more things you can repeat – both under duress and in normal situations – the better your results will be. It doesn’t have to “look” better, but it does have to be repetitive. So, if you are not able to be repetitive at the point of release – that is, you are falling off shots – then the consistency and strength of your results will suffer for it. Good results will always trump technique or picture perfect form, but the conversation can’t end there. Happiness trumps all. If you are truly happy with your bowling performance, why change anything? Never make changes to your game just to look like someone else or to be someone else’s idea of what a good bowler looks like. Always let your scores speak for themselves. I have seen a few unconventional bowlers in my career who have totally baffled me as to how they could ever shoot more than one high score, much less a series of them, yet I have seen more than one tournament director hand them the winning check. Make sure you are being honest with yourself and not just “settling.” Sometimes bowlers would like to be more successful, but past efforts to make changes have either met with failure or the effort required was too great for the perceived benefit. I have had more than one bowler hand me hundreds of dollars for a multi-day clinic only to proclaim they don’t really want to change anything. They just want me to show them how to get higher scores. All of those bowlers left the clinic happy with a host of positive new changes under their belt. It always turns out they really needed to make changes, but they were never shown an effective way to make them. Sometimes you might need to try a different coach if you are not making progress with the one you have. If I am not helping you, then by all means try a different coach. I won’t mind. A player’s development is far more important to me than my ego. I hope all my fellow coaches feel the same. Remember, happiness trumps all.